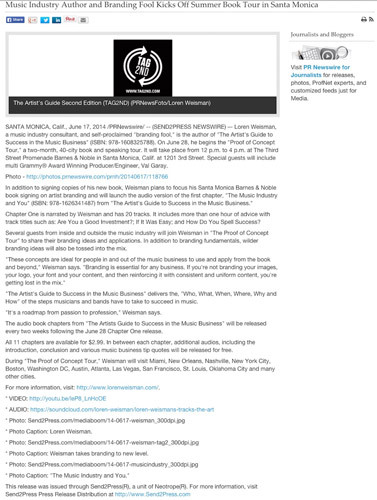 Press releases are common practice in the music business. Keep your press release under 400 words and get right to the point, whether it’s an announcement, product, or event. Make the release quickly cover the who, what, when, where, why, and how of the information you’re putting out there. Your release also should cover standout points about why your product or event draws people in and why media should be interested in either covering it or doing a story on it. Just saying it’s a new album, or you’re “dropping a single,” “playing this night here,” or whatever else doesn’t garner interest unless you’re already famous. Dig deeper to entice, attract, and excite those who read thousands of boring press releases and announcements every day. Here’s an example of a release that combined both a product and an event with the launch of a book tour in 2014. This covers each of the 11 elements previously listed and allows for the most interest from the most people to make the event itself successful. Press release example with all 11 elements included. There’s no need to add “immediate release” to the top of your press release if you’re sending it out yourself. This is commonly copied and a thing of the past when releases were faxed or mailed out to differentiate from other releases that were not set to go out that day. Lose the immediate release line; it doesn’t need to be there, and it makes you look unprofessional. It’s not about writing a book; it’s about using 400 words to draw as much interest in the event or product as well as serve to maintain and continue to grow interest in the future as your announcement or press release continues to build online optimization. In the release shown, several items were mentioned: a list of guests coming, an announcement about a series of audio chapters being released, the kick-off location, as well as some of the other cities for other events, and product details and description. This helped make the event and the press release more than just a single piece of promotion. There was a focus on the discussion of branding at the signing, showcasing more than just a book signing. These elements and this template applied to your event or product press releases give you better exposure, optimization, and engagement from both fans and media. If your release is about a product, be clear about the key locations where that product can be purchased. If your release is about an event, add a little more information or include the short bio of the location where you’re playing. Either way, keep it interesting and keep it full of sentences that could easily be grabbed and reorganized by someone who might write a story about you or your event. If you make it easier for a reviewer, writer, or editor to do a story on you or your release, you have a better chance of getting promotion and publicity from it. Think from the standpoint of who you send your release to, and make it easy to get a story written about you and for you.